It took a long, long time for Batman to get a game worthy of his name. But in Batman: Arkham Asylum, fans were finally given the opportunity to truly become the Dark Knight. A well-designed game from top to bottom with a great combat system, good dialogue, an intriguing, original story and a distinctive artistic style, Arkham Asylum was everything we love about Batman and videogames in one amazing package. The game's aesthetic attempts to be both more "realistic" and more grotesque than the comics, and every character was given a redesign with that in mind. Batman's outfit is the least altered, but he gets some Dark Knight-style armor pieces and, oddly enough, pupils. The Joker is stretched taller and thinner than usual and is given a touch of the disturbing "decayed" appearance of Heath Ledger's portrayal, but with his trademark Conrad Veidt face from the comics. 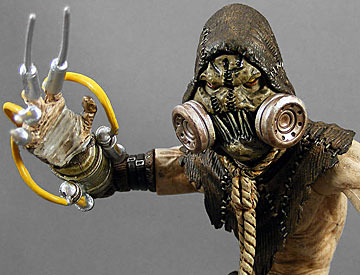 Harley Quinn is famously tarted up as a naughty nurse, but perhaps the most radical redesign among the game's central characters is that of Scarecrow. With the exception of Clayface, Scarecrow seems to be one of the most frequently redesigned Bat-characters, especially in the animated series, but his general appearance is that of a tall, thin man in rags with a burlap sack mask, wide-brimmed hat and, often, a hangman's noose around his neck. 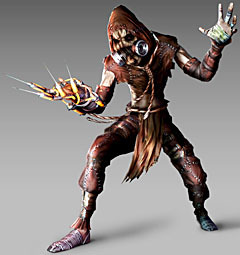 The game designers at Rocksteady took this basic concept and mixed it with a touch of Nightmare on Elm Street 3 and Saw to give us a Scarecrow for the 21st century. Sometimes DC Direct seems to really phone in a toyline; other times, they give it the works. Apparently recognizing the immense popularity of Arkham Asylum - which went way beyond comicbook readers - DCD seems to have gone all-out with this line. The design is courtesy of Rocksteady; the question is, how well did they translate that design into plastic? As you can see, sculptor Jonathan Matthews did a great job translating the videogame model into plastic. There are a few belt buckles out of place here and there, and the hangman's knot seen on the render is absent on the figure, replaced by a bizarre knot that looks like anything but - no idea what happened there. The most impressive part of the figure is probably the texturing of the fabric, which captures the ragged look of the character. DCD's quality control has been spotty as of late, particularly on the aforementioned Dragon Age and Mass Effect lines. While there are some paint issues with Arkham Asylum, they're not on this figure. The paint applications on Scarecrow are, for the most part, excellent. Again, the work on the "fabric" areas is the most eye-catching, with good color choices and a well-executed wash. The only flaw in the paint work is the way the syringe feed system is painted: the silver and yellow parts are a bit thick, sloppy and uneven. 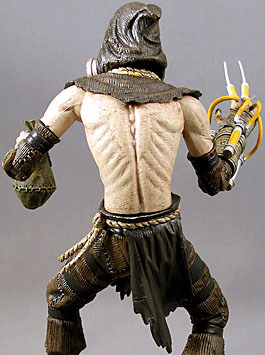 The fabric over the shoulders and the "loincloth" are made from soft, pliable plastic. The needles are a bit soft, and so they tend to bend a bit, but it's not as bad as say, any random ToyBiz Wolverine. Like me, you probably looked at the Scarecrow's heavily pre-posed body and assumed he'd have the least articulation in the line. We were wrong. He has a balljointed head, swivel/hinge shoulders, swivel biceps, hinged elbows, swivel right forearm, swivel left wrist, swivel waist, T-crotch, swivel thighs, swivel calves and swivel/hinge ankles. 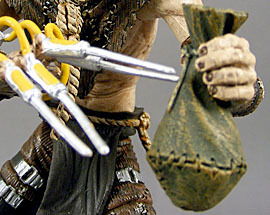 The Scarecrow's only accessory is his bag of... whatever that is, I can't remember. Fear dust, I guess? While the single accessory is a bit disappointing, I also can't really think of what else he could have come with. Personally, given how popular the Joker is, I think it would have made more sense to pack Scarface with Scarecrow and then give the Joker a pistol, or a box of Titan. 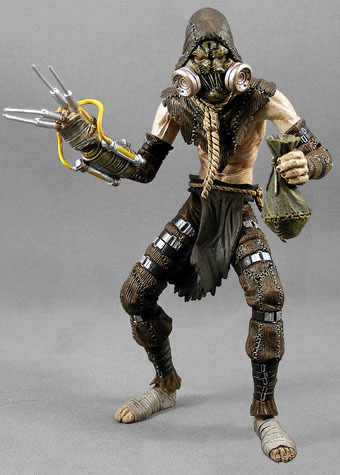 Scarecrow was always going to be the least popular figure in this series, but that's owing more to the popularity of the other characters than his design, which is great. After the "Preacher Hangman" version of the Scarecrow from The New Batman Adventures, this is my second-favorite Scarecrow design, and I'd be surprised if we didn't see the comic version creep closer to this one in the coming years. It's a fantastic-looking design and a great figure.